This is a regular feature which attempts to combine my lifelong passion for baseball cards with my semi-professional interest in celebrities. Born in New York, actress Anne Hathaway came to prominence after her role in The Princess Diaries. 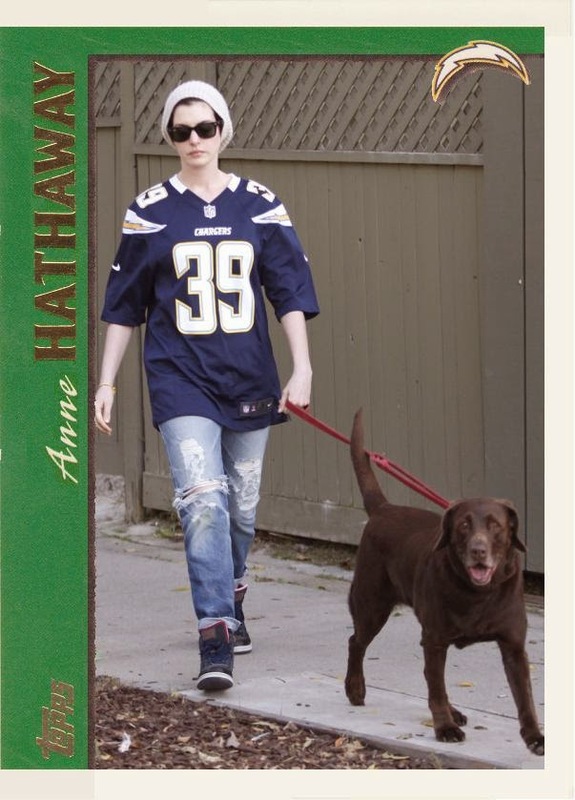 While she seemingly has abandoned her New York roots in favor of a San Diego Chargers jersey, I applaud the #39 (for Danny Woodhead?) and the inclusion of a dog on her Celebrity Jersey Card. Actor Samuel L. Jackson was born in Washington, D.C. and grew up in Chattanooga, Tennessee, yet for his Celebrity Jersey Card, he is representing Atlanta. I am assuming the #1 is just a number, as the Falcons don't have a rich history of players who wore #1. Jeff George is probably the best, although he only played for three seasons in Atlanta.